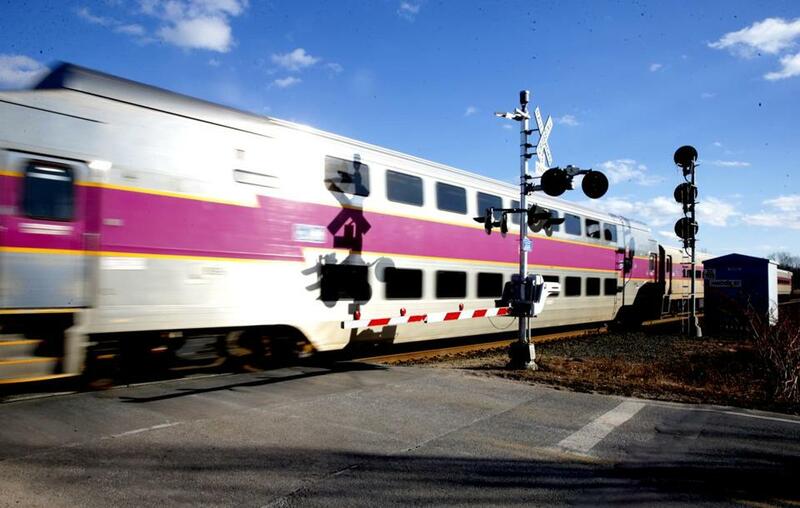 A MBTA commuter train passied a grade crossing as it made its way toward Newburyport Station. TransitMatters has some standing on the subject. A small group of self-described transit enthusiasts who bring a heavy planning and data analysis bent to transportation, the group has gained some measure of credibility with state officials in recent years with well-researched proposals. The group convinced the MBTA to start some bus routes earlier and forced ongoing discussion of an overnight bus route. But those were far more modest than what the group proposed Tuesday — nothing less than a rethink of the entire commuter rail system. Achieving that vision would be a heavy lift. The group suggests electrifying the entire commuter rail system and replacing the existing diesel fleet with new electric train cars, and raising the height of platforms across the system. These actions could speed up trip times by up to 40 percent. Longer term, TransitMatters called for eliminating the Needham line to cut down on congestion along the railroad network leading in and out Boston, replacing it by extending the Orange Line to West Roxbury and the Green Line to Needham. The starting price for this is $2 billion to $3 billion, TransitMatters says, but that doesn’t factor in the cost of the Needham line replacement, or buying new trains, which the T will have to do anyway, the group says. Yet the transit activists are trying to take advantage of an opportune moment, with the state in the midst of a broad reevaluation of the commuter rail while actively seeking to lower carbon emissions from transportation, which could include more electric vehicles. In December, officials suggested the commuter rail system could add express trips from distant locations or more frequent service between stations in and near Boston, with a new commuter rail model in place by 2030. Joe Pesaturo, a spokesman for the T, said the idea is to finish the study next year, before selecting the agency’s next commuter rail contractor in 2022. He said the agency is conducting the study because it shares some of TransitMatters’ goals. Johnson said TransitMatters hopes to influence some of the public discourse around the T’s study. The report proposes the state introduce the plan incrementally, electrifying one line at a time, starting with the Providence Line, on which Amtrak already runs electric trains. The group said its ideas would not require the North-South Rail Link, the proposed tunnel under Boston that would connect North and South stations, but still supports the idea. It’s also unclear whether the T would have enough room for all these trains. TransitMatters suggested the T could boost capacity at an already crowded South Station by turning trains around every 13 to 20 minutes. The T says it is already hitting that turnaround rate during peak periods with most trains, but TransitMatters believes there’s still room for improvement.